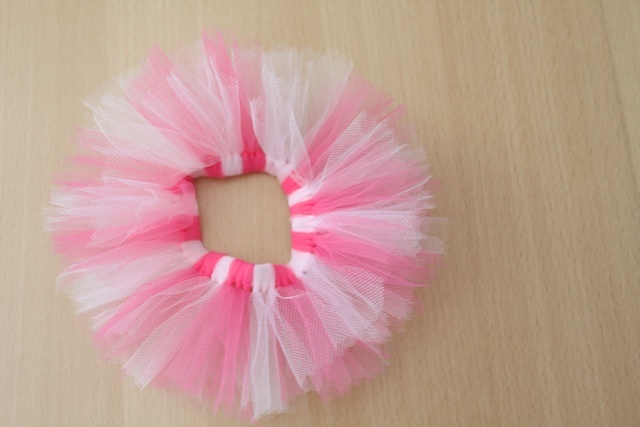 Or you can also call this the tutu for your hair. Kaye is in ballet and tap class this year and she absolutely loves it. She is fully immersed in the ballet and tap culture wanting to look just like a dancer. In fact, she wears a pink leotard around the house most of the time. The dress code for her dance school is pink leotard with pink tights and hair pulled back in a bun. Her hair is pretty impossible to pull back. Her hair frays everywhere and I hose it down with hair spray to keep it in place. Then her bangs are a little too short to pull back into the bun. So I have to get creative with it. Anyway, I decided a ballerina cannot be too pink. 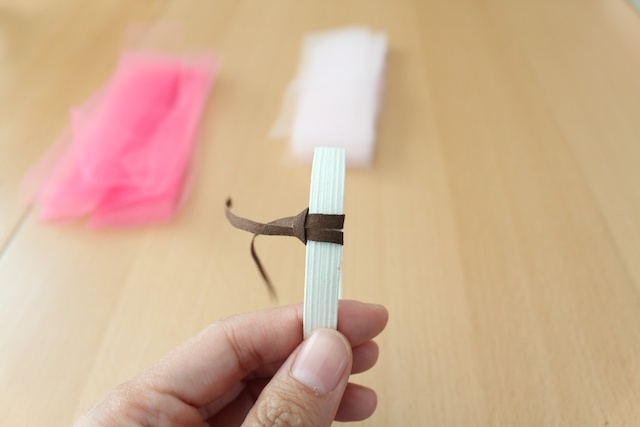 Therefore, I made these simple bun holders to help decorate her hair with a little pink and maybe hold a few stray hairs in place. She loved it. I used the same concept as a no sew tutu. So if you want, you can make a bigger version of this for a tutu. And if your daughter is planning on being a fairy or ballerina for Halloween, this is the fast, easy and cheapest way to decorate her hair. Remember, if you make something inspired by Simply Modern Mom, please upload pictures of it to our Flickr group to show it off to everyone. You may be featured on Simply Modern Mom. 1. 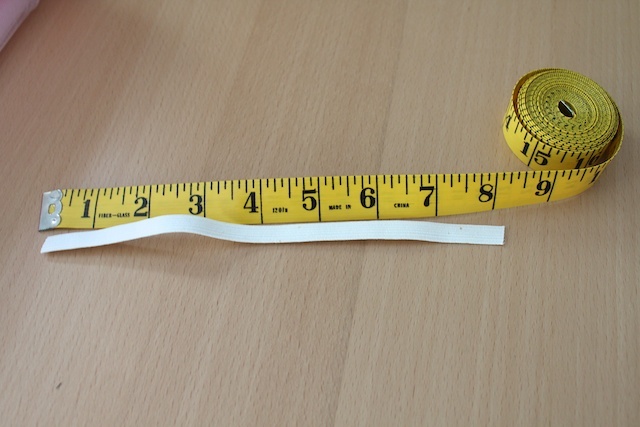 Cut the elastic to 8 inches. 2. Sew the two ends together with about a 1/2-inch overlap. I did it on my sewing machine with a zig zag stitch back and forth a few times. You can also hand stitch the ends together if you prefer. 3. 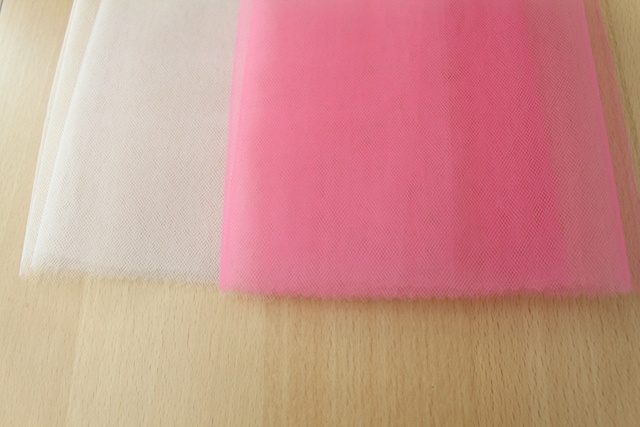 Cut your tulle or nylon netting into 6 x 1 inch strips. I used a zigzag scissors for the top and bottom edges. And to cut the sides, I folded the sides in half, cut the fold and repeat until the strips were about 1-inch wide. I used straight scissors to cut the sides. The great thing about cutting these strips is you don’t have to be exactly straight. You won’t see the difference because it will be scrunched together. 4. 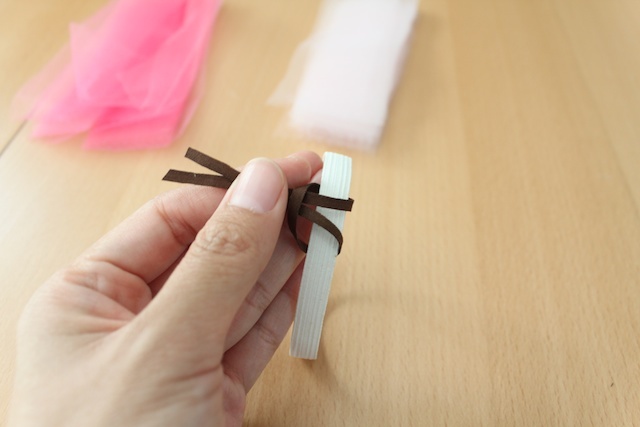 I demonstrated how to tie the strips onto the elastic using the brown fabric so you can see it better. It’s just an example, don’t actually use the brown strip for the bun holder. First you fold the strip in half. 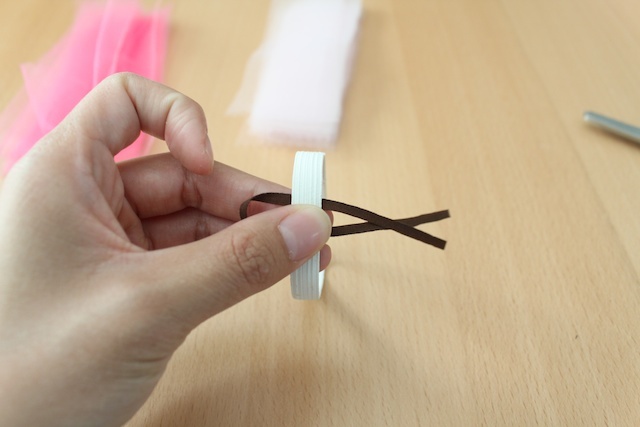 Then put the elastic over it with the loop of the strip on one side and the ends on the other. 5. Pull the end through the loop while going over the elastic. Then pull tight. 6. Repeat steps 4 and 5 until the tulle or netting covers the entire elastic. I switched colors every 3 ties. You can do your own variety or just do it all in one color. Since it is elastic, if you want the netting to be fuller, stretch the elastic a little to tie more netting onto it until desired fullness. And done! » Tell me… Does or did your daughter take dance classes? 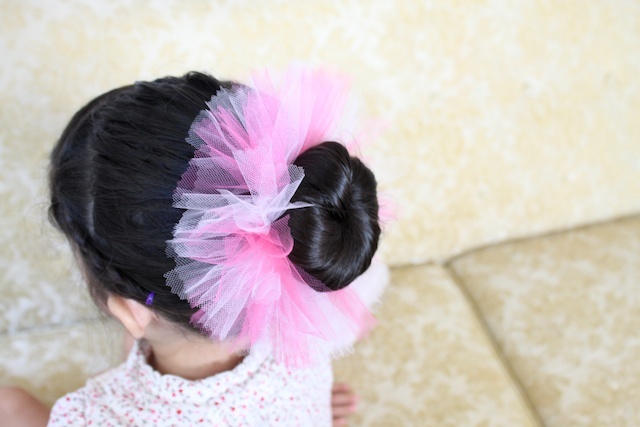 What kind of hair accessories do you like to put in your daughter’s hair to keep it out of their faces? Any tips you can give me is much appreciated. My daughter is not yet in ballet, I can’t wait for the day when I can take her, but I don’t have a car at the moment 🙁 She wears her dress up around the house all the time which is usually old ballet hand me downs from her aunt. She too has bangs and it is so hard to pull them back, but I use sooo much hair spray. It’s not the best thing in the world for their hair, but it works to keep those little hairs in place! Thanks for the tutorial, super cute! She has a skirt that is made this way (a friend gave it to her) except they used a ribbon for the band and then you tie it in the back. 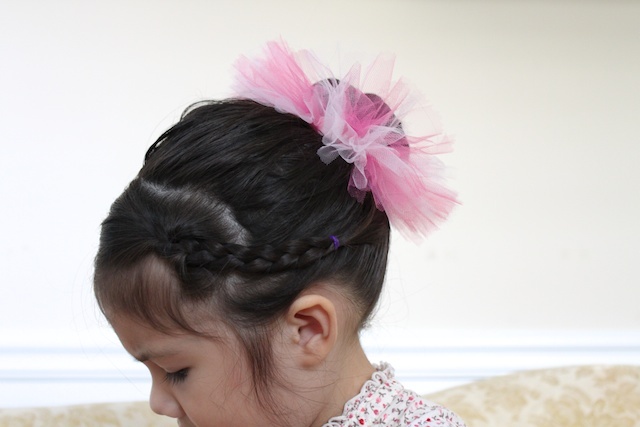 I have just gone the standard ponytail route for ballet over the last year, but after seeing these (and knowing I have a stack of leftover tulle from the tutus I made as party favors at her birthday last March) I am whipping this up for her first class this fall. My daughter dances and when I really want the bun to stay tight I put a hair net around the bun. Then there is no way any strands will get loose. This is so adorable!!! I love it! Thanks for the instructions! My daughter dances. When I do her hair I make sure its good and wet and then put gel in it. A bun cover and lots of bobby pins (the big kind for buns) and it stays all day for her recitals. Thanks so much for this tutorial. I’m gonna give it a try. She’ll be so excited. Keep the ballarina projects coming! yes. i’ve seen those bun covers. i may have to give those a try too. thanks for the idea! Oh my!!! I love this!! 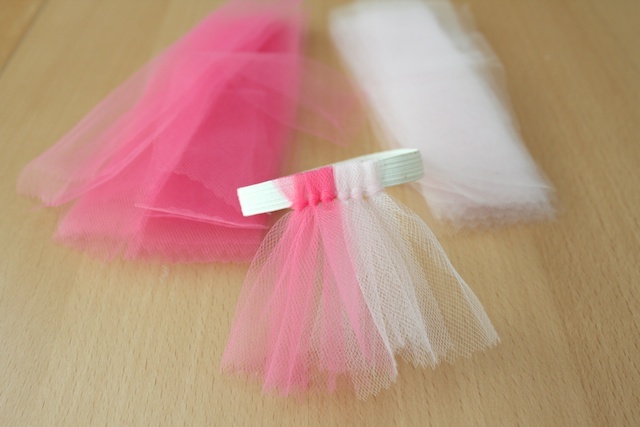 I have to go and buy tulle and make lots and lots of this (or at least till I get tired). My DD is 7 and she will outgrow this so soon. Waahhh! Aww, that’s so cute! Thanks so much, I’ll be linking. My daughter want to be Tinkerbell!! Perfect! that is perfectly fine, jenn. thanks for letting me know. pretty much as long as you link back to my site and give the proper accreditation then you’re good. Anyway, hope it helps! 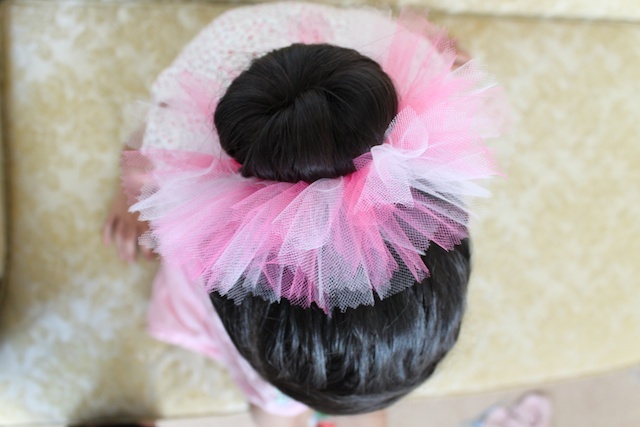 LOVE the bun tutu. Wish I was young enough to wear one myself! I love this, and cannot wait to make one! It will look great incorporated into some of our fun hairstyles. Hi!I danced for years and years and if you’re trying for a regular bun(a ponytail twisted around itself,if that makes sense),then I would highly recommend using long hairpins instead of bobby pins.Those little silver Goody clips are good for the whisps that don’t quite fit in the bun,and you might want to try their new spin pins,I’ve read alot of good reviews about them.Hair nets are a must. I found this from Jenn over at Girly Do’s. What a FANTASTIC creation! I love it! I can’t wait to make one. My girly is in ballet and doesn’t love pink, but does loves black, so I’m thinking black with a touch of pink would be cute. Thanks for sharing! This is adorable, thanks for sharing! 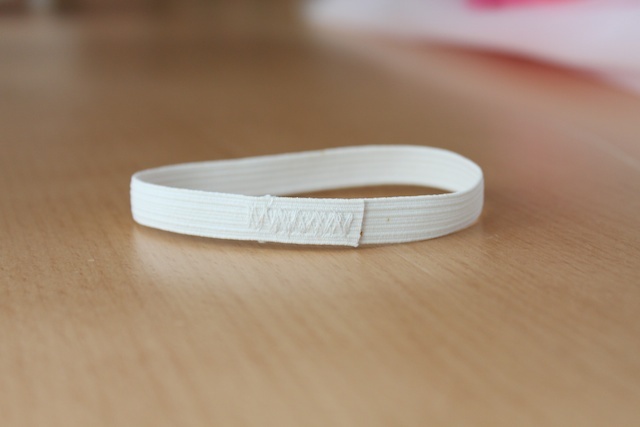 I may do it with an ouchless no-metal rubber band instead of elastic, as that’s what I have on-hand! LOVE the idea! I just love your blog. Thank you for sharing your ideas.